Sue Shink prevailed in this three-way race on Aug. 7, winning 66.53% of votes cast. She faces Republican Kevin Jardine on the Nov. 6 ballot. Click here for full local election results. Rodrick Green is an attorney, Superior Township trustee, and pastor at New Hope Baptist Church in Ann Arbor. In the Aug. 7 Democratic primary, he faces Tom Brennan and Sue Shink for the District 2 seat on the Washtenaw County Board of Commissioners. The winner will face Republican Kevin Jardine in the Nov. 6 general election. That seat is currently held by Democrat Michelle Deatrick, who is running this year for the Michigan Senate in District 18. Green was first elected as a Superior Township trustee in 2004, and won re-election in 2008, 2012 and 2016. 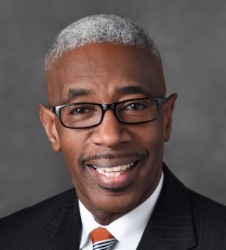 He serves as an officer of the Southeast Michigan Council of Governments (SEMCOG) as the township delegate for Washtenaw County, and previously was chair of that group. He also served on the Washtenaw County Road Funding Committee. Green has been pastor of the New Hope Baptist Church since January 2008. He is the second pastor of that church, which was founded by the Rev. Dr. Albert J. Lightfoot Jr. in the mid-1960s. Green is a member of the Washtenaw County Bar Association. According to the WCBA website, Green's legal practice is based in Ann Arbor and focuses on family law and general civil cases. Green earned his law degree from the University of Michigan. He received a master's degree in divinity from Virginia Union University. He also served in the U.S. Army and the Michigan National Guard. He is married to Regina Green. The couple have twin daughters and live in the Geddes Ridge neighborhood. Green is serving as treasurer for his campaign.